When Zac Vawter lost his leg in a motorcycle accident a few years ago, he thought he'd never walk like a normal person again. But today, the 32-year-old software engineer can climb stairs, wiggle his toes and stroll through parks. The only difference is that one of his legs is a mind-controlled robot. 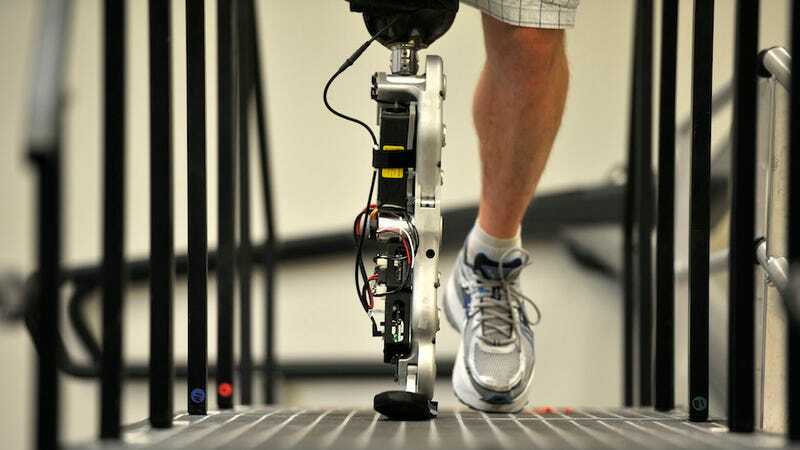 Vawter is a "test pilot" for an Army-funded study on the latest in bionic limb technology. The leg that's been fitted to him comes from the Rehabilitation Center of Chicago's Center for Bionic Medicine and almost obviously represents the future of prosthetics. "In my mind, it's still the same thing in terms of moving my ankle down or up, or extending my leg forward or back,” Vawter told Bloomberg. "It's just walk like I would normally walk. It's not special training or buttons or tricks. That's a big piece of what I think is groundbreaking and phenomenal about this work." The limb is close to flawless with just a 1.8 percent rate of errors. It's connected to his leg through two nerves that were rewired to his hamstring and linked to the limb through sensors. When Vawter thinks about standing up, the limb lifts him up. When he thinks about bending his knee, the knee bends. And that's it—no extra wires connecting to a computer that Vawter has to carry around and no extra engineer steering the way. This was not the case with the prototype that Vawter used to climb the Willis Tower in Chicago last year. That device had a limited range of movement and required an engineer on hand to operate it.